Moldova’s acting President and Parliament Speaker Mihai Ghimpu, known for his sweeping pro-Romanian rhetoric and policies, said he would not annul his decree declaring June 28 Soviet Occupation Day. According to the decree, June 28 could now be known for Moldovans as Soviet Occupation Day – one that will be marked as a day of nationwide mourning. The monument was set up on Sunday on the instructions of Ghimpu's relative, city Mayor Dorin Chirtoaca, in the central square of Chisinau. “We will not annul the decree. May each one act the way he deems proper. I, as acting president, have already made my position clear on this,” Ghimpu added. A special parliamentary meeting was supposed to be held on Monday to discuss the decree made by acting president and parliament speaker Mihai Ghimpu. However, the meeting was cancelled by Moldova’s ruling Alliance for European Integration party. This decision was met with strong words from the opposition Communist Party’s leader, Vladimir Voronin. “We think that the Alliance for European Integration has become an opposition to the people, usurped power and supported Ghimpu. There is no difference who makes decisions and who signs ordinances. The entire Alliance for European Integration is responsible,” Voronin said. Ghimpu’s move was initially met with opposition by the Alliance, who tried to cancel the decree on the grounds that the decision was made without consulting other members of the quadripartite coalition. “Formally, there are two ways to cancel a decree: whether [Moldova's acting president Mihai] Ghimpu cancels it or the Constitutional court does, which the acting opposition on the part of the Communist Party appealed to,” Moldovan Democratic Party leader Marian Lupu said. The legality of the decree signed only on June 24 will be checked by the country's Constitutional Court and will decide its fate, Lupu declared after a joint conference held on Monday morning with the participation of members of the ruling coalition and acting president Ghimpu. Many saw the Alliance’s initial attempts to cancel the decree as the first sign of its impending dissolution. But, in the end, the special parliamentary hearing didn’t push through and the three members of the quadripartite alliance failed to convince Moldova’s acting president that the ordinance marking June 28 as Soviet Occupation Day must be repealed. The decree came under heavy criticism by the opposition party of Moldovan communists and other leftwing parties who called on the Moldovan parliamentarians to dismiss the acting president. Leader of the opposition’s majority party, the Communist Party, Vladimir Voronin has demanded the immediate resignation of Ghimpu. “This man has proven his inability to govern the country more than once. He became the president by accident and he disgraces this country. He must step down immediately because his actions disagree with the opinion of the overwhelming majority of citizens,” Voronin told a press conference on Monday. In fact, recent polls show that Ghimpu's popularity rating is less than 2%. Ghimpu was made acting Moldovan leader in September 2009 when the country's liberal-democratic coalition was forced to find a compromise after failing to appoint another candidate. 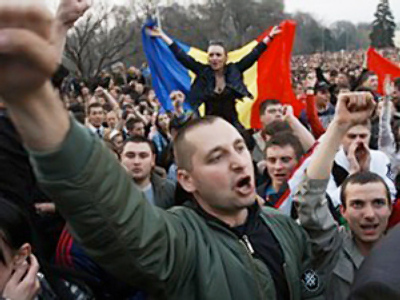 Leaders of the Gagauz autonomy, the city of Beltsy – the second biggest city of Moldova – and a number of other Moldovan towns refused to comply with Ghimpu's decree on Soviet Occupation Day. Ghimpu’s order was also criticized by Justice Minister Alexandru Tanase, vice president of another Alliance party led by Prime Minister Vlad Filat. Ghimpu has denied the accusations of trying to gain political assets by issuing such a decree. “I have not hurt anyone by my decree declaring June 28 the day of Soviet Occupation of Moldova” Ghimpu said at the ceremony for unveiling the Memorial Stone to Victims of Soviet Occupation. “I am not trying to gain political assets by this decree. A decree is not an action against the Communist Party of Moldova, it is aimed against Soviet and Communist symbols, which have hurt many families in Moldova that were taken to Siberia during Stalin’s repressions,” Ghimpu said. Russia’s peacekeeping contingent is stationed in Transdniester, the republic’s breakaway region. In addition to the peacekeeping mission, the roughly 1,500-men-strong OGRV also guards stores with weaponry which belonged to the Soviet Union and now is Russia’s property. Part of it has already been transported to Russia. Shortly before the collapse of the Soviet Union, on September 2, 1990, five regions located mostly in a strip between the Dniester River and the eastern Moldovan border with Ukraine declared the creation of the Republic of Transdniester. The Moldovan leadership did not approve of the move and sent troops into the region, which resulted in a military conflict in 1992 . Currently the peace in the conflict region is maintained by Russian, Moldovan and Transdniester' peacekeeping contingents and by Ukrainian monitors. On June 28, 1940, at the USSR’s request, Romania withdrew its troops from Bessarabia and Northern Bukovina, which it had been occupying since 1918, and the region joined the Soviet Union. The Moldovan Soviet republic, including six Bessarabia districts as well as six areas from the left bank of the Dniester, was established in August 1940.